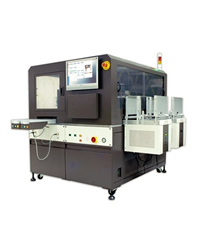 HL-770 Automated Tray IC Lead / Mark Inspection System | FALCON DENSHI K.K. HL-770 system performs efficient and precised lead inspection, ball inspection, mark inspection and surface inspection with accurate 3D optical measurements for ICs on tray. System operates two sets of Tray I/O alternatively with two independent pick & place motion mechanisms. The lead scanning mechanism performs multi-unit pick & place lead / ball scanning while the mark scanning / sorting mechanism performs column-by-column mark / surface scanning as well as sorting and binning of pass and fail units. This multi-task design makes system throughput up to around 15K ~ 35K UPH for Tray In ? Tray Out operation and around 8K ~ 13K UPH for Tray In ? Tape Out operation depending on IC package size. System performs lead and mark inspection for ICs on tray. Two sets of Tray I/O load trays onto lead scanning area alternatively to perform multi-unit pick & place lead / ball scanning. Trays are then moved to mark scanning / sorting area to perform column-by-column mark / surface scanning, failures are then sorted to lead / mark failure trays while the vacancies are fed with spare passes and then moved to Tray Out stack or optional Tape Out device via multi-unit pick & place tray-tape conversion. System provides 3D measurements of lead pitch, lead width, lead co-planarity, lead span, lead skew, terminal dimension, standoff …etc. for TSOP, QFP… packages. System also provides 3D measurements of ball pitch, ball diameter, ball co-planarity, ball offset, ball height, ball shape, ball quality…etc. for BGA package. voids or bleeds in the mark, broken or smeared characters...etc. The 3DX, accommodated with 3 high resolution digital cameras plus working with powerful I-Cite vision software, provides the algorithms for high speed, accurate 3D image acquiring and measurement. Sub-pixel algorithms maximize accuracy of measurements to 1/4 pixel. Parallel scanning and sorting, up to a third or a quarter of tray units each pick & place for scanning and 10 units each pick & place for sorting / binning, visual scanning on the fly without having to stop and position as well as extremely high speed image processing contribute system throughput up to 15K~35K UPH depending on IC package size. summary with detailed CPK data for Process and QA engineering. Pick & Place Scanning: Tool-free replaceable nozzle module. Nozzle matrix: 25 x 3 nozzles max.